I remember trying to memorize Multiplication Tables when I was in elementary school! Oh, they were NOT my friend! Were they yours? Some of my friends seem to know 7*6 better than I knew 10+1. I was never very good at math and those tables drove me nuts! Now, I have three children. Each one of them has their own talents. One loves math more than the others, one is growing a passion for math and well, one may never truly enjoy math. That’s OK-It is not the end of the world. But, I have been on a mission to make math fun. One thing all of my children enjoy is listening to be read out loud. Do your children enjoy a good living book that teaches them about anything from A to Z? YES! You know, those wonderful books that weave math, grammar, science and history into it’s pages and our children absorb all they have to offer! What about math? 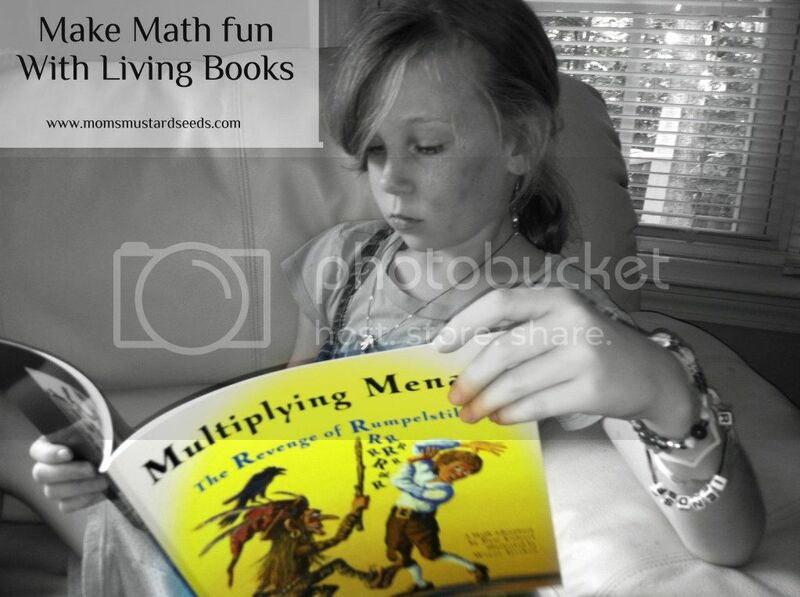 Really…have you found some good living math books? I recently found a really good one that is filled with some funny humor and great ways to learn math! Multiplying Menace – The Revenge of Rumpelstiltskin by Pam Calvert begins at the birthday party of Peter, the Prince who was saved by his mother the Queen in Rumpelstiltskin, when she screamed “Rumpelstiltskin, Rumpelstiltskin, Rumpelstiltskin!” They are celebrating his tenth birthday. As his party is ending, an uninvited guest arrives, can you guess who? YES! Rumpelstiltskin! As Rumpelstiltskin grabbed the boy and ran away, he pointed his stick at objects and muttered words, which then caused various actions to occur. What kind of actions you may ask? As he ran past the castle wall, he said: “Stones times one third”…and every third stone disappeared. Standing in a hole in the wall was the King. Rumpelstiltskin could not resist leaving the King alone…and shouted “Nose times six” – guess what happened…. YES, the King had SIX noses! The story continues, as Rumpelstiltskin takes the boy back to his crooked and very dirty hut. After hunger overtakes Peter and his concern for his Dad (who now has six noses) grows, brave Peter grabs the stick (while Rumpelstiltskin is napping) and tries to learn how to use the stick in an effort to leave and help save his Father and the Kingdom. I am not going to tell you how the story ends. However, I will tell you this, it is a GREAT book to read with your children and talk about multiplication. It is woven throughout the story and is just a fun way to integrate it into your reading time with your family. The book ends with an explanation about multiplication and even provides a neat little way of understanding fractions! You may be asking: Did my children enjoy it and use it? YES. Our middle child, who is just learning to enjoy reading and math asked to take it on our camping trip last weekend! We did not take it (for fear it would get ruined)…but we did talk about the story in our tent and that funny Rumpelstiltskin! What Living Books have you read for Math? Disclosure: I received a free copy of Multiplying Menace in exchange for my honest opinion. No other compensation was received. I never loved math and neither do my girls. Piper has three chapter left in Math U See and I told them this summer we will do fun math stuff, like this. I am going to put a hold on this book or buy it! Thank you for the recommendation!!! Also, I love the new look, new font! Very pretty! Theresa, we are reading some of the other books…and loving them. I can’t wait to have a whole list of books to compile for everyone…and our home library full of them. Thanks for stopping by! Sounds like a great book. I need to get some Living Books in our classroom. Sounds more inviting than the boring old text. Robin, We started with living books a few years ago, but I really never thought about math….until the past six months when I met Kerry and read her blog. She has some great suggestions! Oh, Rebecca, this book sounds terrific! I’m definitely adding to my library since I’ve got three left to learn multiplication. My oldest abhors math and yet my middle daughter really enjoys it. I recently purchased two books from the “Life of Fred” series. I kept hearing other mothers mention the title and one day I found it in the Queen Homeschool Supplies catalog. They are lovely, hardcover books with short chapters about “Fred”. At the end, there’s a “Your Turn to Play” for the kids to answer a handful of questions. We literally read the very first chapter of the first book, Apples, today so I’m keeping my fingers crossed that the girls enjoy it. I have been considering LOF, myself! I hope to purchase one or two soon….but, will have to see. Would you mind emailing me some information about them? I can’t quite figure out how the series works….and which ones I should purchase. Thanks! Susan, I don’t think I knew about livingmath.net – thank you! I have visited love2learn in the past and I thought I had it on my resource page….very odd that I do not! Thank you so much!